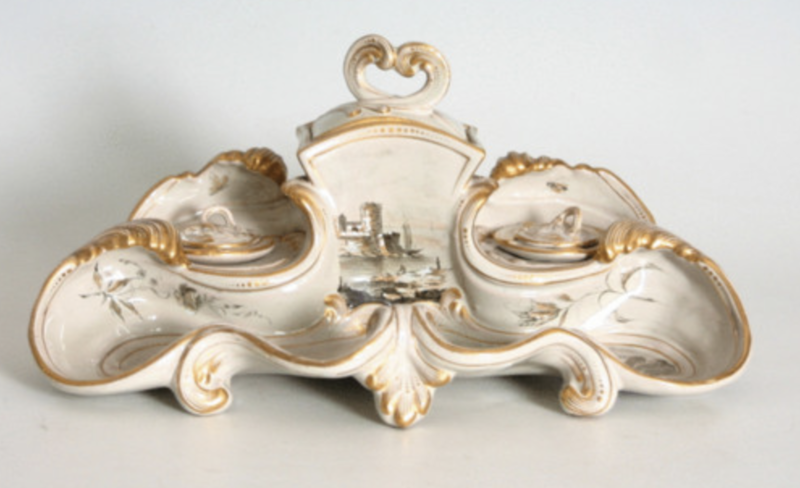 The shape of this inkwell was used several times, but always with different decorations. The more refined the picture and the drawing, the higher the price. This one has a very unusual design of a man working on his land and the sea behind him. Also finishing with gold enamel which was more expensive. The inkwell is complete with original containers and lids. One very small restoration on the top lid, just a few millimeters in the corner. Compare this inkwell to the ones in a book called: La ceramique de Galle , edited by the museum in Nancy and you'll see the difference.